It is with great sadness and a heavy heart that we must announce, that through the emergence of new technological data, we have lost one of our Beacons. Perhaps, sticking to Welsh Folklore and Myth, which we are accustomed to in the Brecon Beacons, it would be more apt to state that one of our mountains has turned into a hill. Fan y Big, part of the high ridge heading easterly from our famous Pen y Fan has lost its status as a mountain after new data revealed that it didn’t actually meet the strict criteria. The classification requirements state that mountains are required to be at least 2,000 ft tall (610m) and have a minimum drop between the summit and col of 98.4ft (30m). Fan Y Big peers proudly at a height of 2,351ft (717.6m). However, the new drop measurement, completed using satellite technology has been recorded as 93.4ft (28.5m) which is 5ft (1.5m) less than what is required for mountain status. Myrddyn Phillips from Welshpool surveyed the hill and recorded the new data using satellite technology and as a result Fan y Big has been struck off the list of Hewitts – Hills in England, Wales and Ireland over 2000ft high (610m) with a minimum drop between summit and col of 98.4ft (30m). 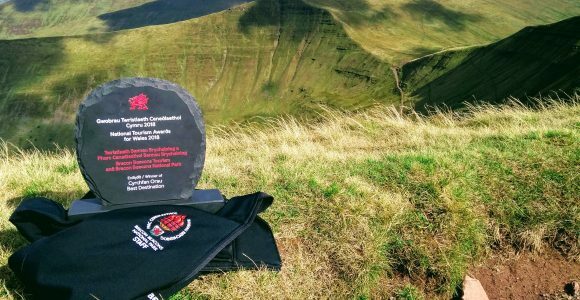 Although, on paper we may have lost a Beacon, we all know at Brecon Beacons National Park that Fan y Big will continue to be a mountain to be climbed, a peak to be reached and a summit worth seeing. Let the satellites and figures show what they may, but underneath the starry night sky, the Fan y Big Beacon will continue to be a pinnacle at Wales’ Best Destination.